At Omnilert, we do more than improve the speed and technical capabilities of our solution; we continually strive to engineer human error out of the communication process by making it as user-friendly and automated as possible. When it comes to emergency communication, technology isn’t truly advanced unless it’s reliable and easy to use. That's what makes Omnilert different. 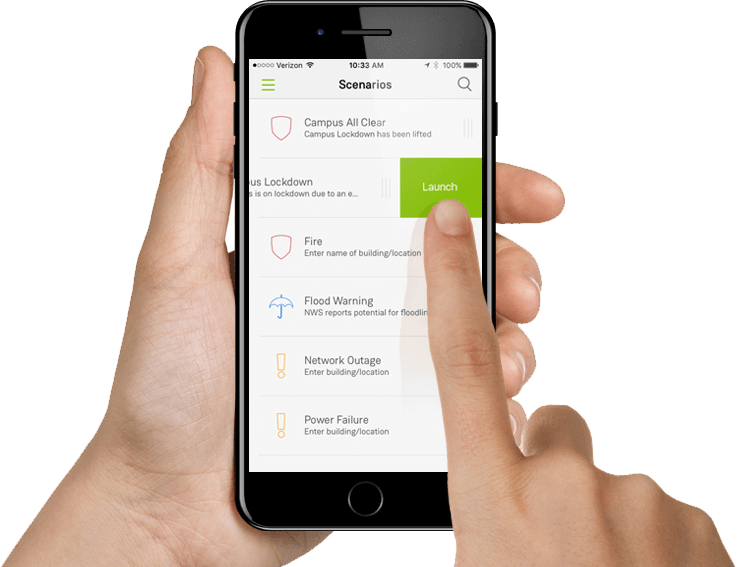 Our emergency communication technology puts great power at your fingertips, allowing you to perform multiple functions simultaneously and automatically. The result is a coordinated emergency response that’s simple to deploy even when you are operating under extreme stress. 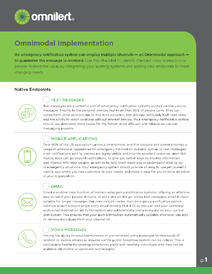 This, combined with the comprehensive Success Program, is what defines the Omnilert approach to mass emergency notifications. Our mission is to give you the greatest possible advantage when it comes to emergency response. 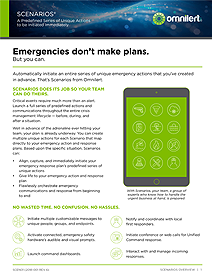 When you and your team are under duress, Omnilert’s mass emergency communication technology delivers simple, split-second notifications that allow you to execute your emergency plans with a single touch from your desktop, phone, or Apple Watch. No two emergencies are identical, and every emergency is fluid. As a result, you need the capability to adapt to each unique situation. 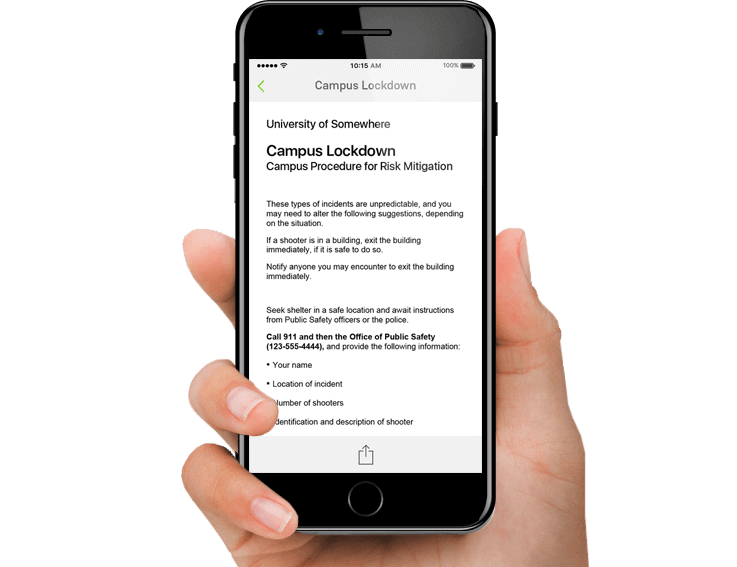 Omnilert’s emergency communication technology gives you the ability to send detailed instructions to your people quickly and easily—right from your phone, desktop, or Apple Watch. Active shooters. Fires. Weather emergencies. Bomb threats. You face a lot, but you don’t have to face it alone. 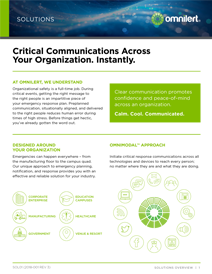 You have Omnilert’s mass emergency communication technology on your side. 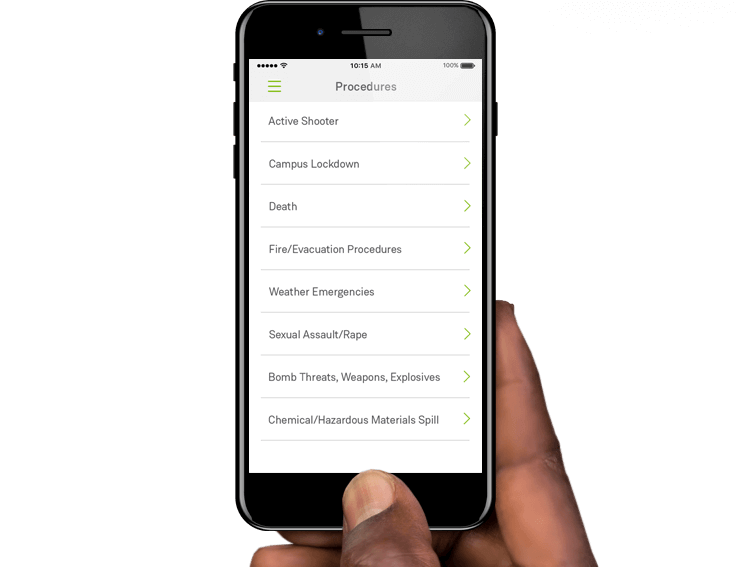 With Omnilert Scenarios™, you can predefine a set of detailed actions that can be set into motion at a moment's notice—allowing you to save precious seconds and lives. When the safety of your people and property depends on your ability to disperse information, your mass notifications must reach as many members of your organization as possible. Omnilert maximizes your reach, hastening messages to all intended audiences with the highest possible speed. Armed with innovative and intuitive tools, you are empowered to protect what matters - when it matters most. Unlike traditional call answering systems, the hotline can handle thousands of incoming calls without busy signals or placing callers on hold. Administrators can instantly generate hotline messages from either text-to-speech alerts or pre-recorded voice messages. During a crisis, your people can easily access these notifications by dialing the dedicated phone number. During critical, time-sensitive situations, communication is key. You can initiate a secure, private phone conference with a defined group. 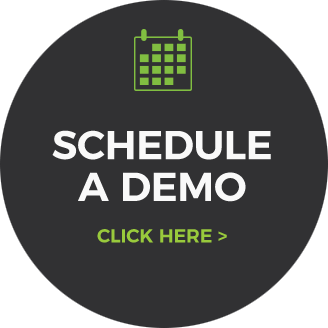 Outbound conferencing facilitates instant collaboration with members of the response team. You can enhance situation monitoring and response by enabling message recipients to acknowledge receipt of an alert, signal their location, confirm their ability to respond to a particular situation, report on their personal well-being, or simply provide useful information. You can easily and efficiently integrate the important functionality of the emergency notification system within your own website—without the need for technical experience or specialized training. 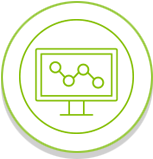 You can capture and analyze communication and response effectiveness through an easy-to-interpret interface. Omnilert’s advanced emergency communication solution can be adapted to suit any emergency notification needs. The high-performance technology is comprised of software and infrastructure that ensures consistent, reliable performance—so emergency communications can be as fast, complete, and as precise as possible. Your organization is afforded a failure-resistant infrastructure that is not burdened with maintenance, system security, or software updates. You can log in from any desktop or mobile device. You benefit from a solution built on a flexible, loosely-coupled architecture; that is to say, technology that is easily scalable and more quickly adaptable to constantly evolving technology (from software to hardware) and processes that will emerge in the future. You are implementing a solution with the ability to perceive what is not operating correctly and, without human intervention, make the necessary adjustments to restore to normal operation. Your organization is connected to over 3,300 carriers, with access to APIs that enable easy integration with third-party solutions. "When every second counts, you can’t leave any room for human error. That’s why we’ve engineered a solution with as few steps as possible to launch a response – even with a single touch."